Figure 1-3. 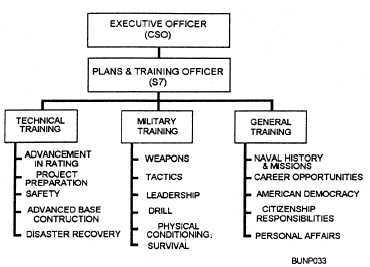 - NMCB training organizational chart. well-trained Seabees and Builders, and makes advancement difficult to achieve. Training for advancement is an ongoing concern for all personnel at all levels. The Navy benefits by your advancing in rate. Highly trained personnel are essential to the Navy's mission. By each advancement, you become more valuable as a technical specialist and as a person who can supervise, plan, lead, and train others. As the Navy implements training programs, so does the NCF. Training our Seabees in battalion during home-port periods becomes the primary mission. They expect to spend about 75 percent of the available man-days in formalized technical, military, and general training classes. In addition, the planning and estimating teams that plan deployment projects may be considered to be involved with OJT. Approximately 2 months before an NMCB returns from deployment, a training team is sent back to its home-port regiment for a training conference to prepare the training schedule for the home-port stay of the battalion. This team schedules the training required for the battalion to meet its operational readiness and construction tasking for its next deployment. The team also coordinates home-port support for berthing, supplies, recreation, and billets for training support (FSB/PRE). All personnel are trained in the areas of technical, military, and general topics. However, programs may be tailored to meet the specialized mission of the battalion's next deployment. If one of the projects scheduled is the repair of an airstrip, undoubtedly there will be a great deal of training in regard to rapid runway repair (RRR). This is when the Naval Construction Regiments (NCRs) play a vital role in training. You will need to know how many qualified personnel are available and whether you need to train more to repair the airstrip. Take advantage of any opportunities to train as many of your personnel as possible. "Muster and make - it" is NOT a training evolution. As supervisor, you may check a member's service records, conduct PRCP interviews, and select those best suited for training given at a Navy C-1 advanced school or at a special construction battalion training course (SCBT). On-the-job training (OJT) plays a major role in the development of our Seabees. As a crew leader or project supervisor, make sure your troops are being properly trained. Remember how and when you were trained. For example, one person helps another learn the trade and that person's experience is passed on to others. That is OJT. OJT happens around us all the time. There are as many examples of OJT as there are contacts between personnel in the Seabees. In a Seabee organization, OJT is important because of the continuous changes in equipment and personnel. It also provides continuous opportunities for new and better methods of doing construction work.